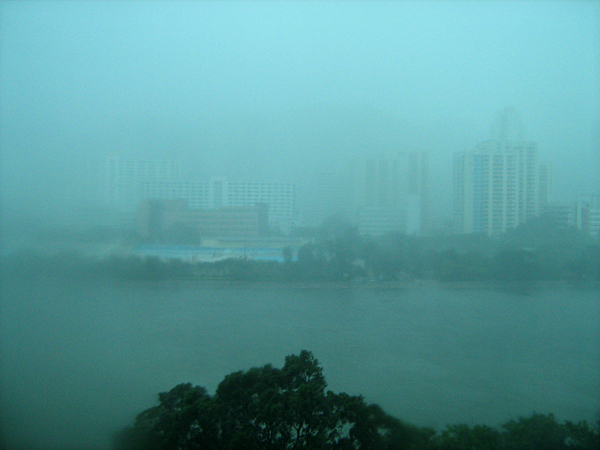 I couldn’t even see the mountains and at times even the apartment buildings disappeared. Wow! Pretty crazy weather. I noticed a piece of paper by my room door. It was a notice about the Typhoon Signal 8 warning. All training sessions at the venue had been suspended until further notice and the shuttle buses were on reduced service. Good news is that I was able to catch up on a bit of computer work. Bad news is that boredom kicked in pretty quick. Mike had arranged for a day pass for me to the Olympic Village so Ali and I headed over on the shuttle bus. I enjoyed a fa-bu-lous lunch in the athlete’s restaurant that included roast beef, chicken stuffed with lobster and shrimp. Of course I had to help myself to some blueberry cheesecake as well. Hey, I make sure to take advantage of the few times I get to eat at the Village! The restaurant was packed as many of the teams stayed to wait out the storm. The weather is supposed to improve by the evening so imagine that the venue will be hopping as people take out their horses for some excercise. I’ll be heading there for the team leaders’ meeting so it will be interesting to see how the fancy footing handles all the rain that has fallen. 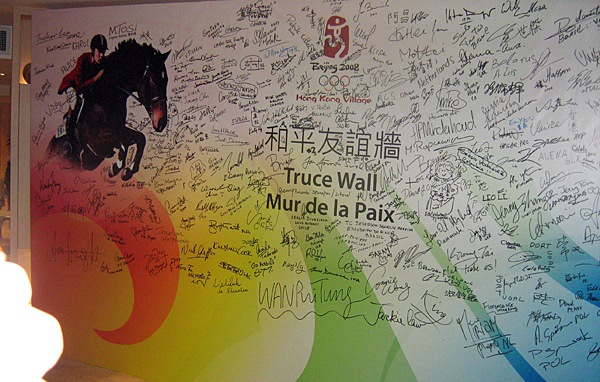 Before I left, I was amazed at how many more signatures are on the “Peace Wall”. It looks great! Time for me to sign off so I can head to the venue for the meeting. ….as they say in Hong Kong – joy gin! Looks like you are having way too much fun. If you happen to run into Megan Jones (http://www.meganjoneseventingteam.com/), her siser Emma and I are on a horse mailing list together. Check out her Canadian reference. I’ve enjoyed reading your blog so much! I check it several times a day to see if you’ve added anything new (sad, I know). I love how you are keeping tabs on all three of the Canadian teams. The pictures are fabulous and are giving us a glimpse of what it is like to be involved with the Games. Keep up the great work and enjoy your time.